Months of anticipation (and one great commercial) led up to this Sunday's launch of Target's most recent designer collab with Prabal Gurung. The lookbook dropped about a month ago and it was love at first sight – which is only appropriate as Gurung named this collection "LOVE." Full of romantic roses, exotic florals, high-contrast black and white, and a big shoe and accessory selection at great prices, I was hooked. The collection went live early Sunday morning (around 2am) and I stayed up to grab the online exclusives and to order any backup items in case my local stores weren't carrying my favorites. An early alarm and a few hours later, I got up to check out the store. I went in with a real plan of attack (and a fantastic shopping buddy) and was able to try on pretty much everything they had on the racks. Surprisingly, there were a lot of shoes in-store that were listed as online exclusives, so I ended up with a couple pairs of shoes (for better or worse)! Oddly enough, the items I came home with weren't on my wishlist. That's what's so great about a lot of these collections — there are always a few dark horse pieces so it's great to experience the whole range in-store, and really get a feel for everything. I never expected to like the lace-up heels, I thought they looked a little odd in the photos online — newsflash — they are amazing. I put them on and knew I couldn't leave without them. This black blouse has a great tonal lace overlay on the front and back, and a faux-leather collar, so I knew I'd want it for upcoming fall/winter. It fit well and had a nice, long drape in the back. When I saw that this dress had a drop-waist, I felt a little uneasy about how it might look — turns out, it didn't look weird at all. The upper portion is soft and just feels like a comfy tee, and the frill portion is a silkier fabric with some flirty movement to it. I absolutely loved this dress and the exotic pattern was even cooler in person. I'm glad that I also grabbed the sleeveless blouse in this same pattern online the night before. Not pictured are the ankle-strap heels in blue and neon yellow, which also found their way into my virtual (and real) shopping cart. Overall, I was really pleased with the quality, prices, designs, and easy shopping experience. That's the bonus of living outside of the major cities, you don't have to fight anyone off because chances are, the store is empty :) I'm glad that this collection seemed to be a success for Prabal but also for Target, after the horrific flop that was the Neiman Marcus holiday collection. They needed something smashing and I think they got it. My shopping buddy and I celebrated a job well done with some pear mimosas and brunch at Market in Rocky River. We filled up on food and got a little morning buzz, and I promptly went home to pass out into a shopping-induced coma. Did you guys check the collection out? What's left at your local stores? I think we make one of the greatest shopping teams since...wait, no, we just make one of the greatest teams EVER. 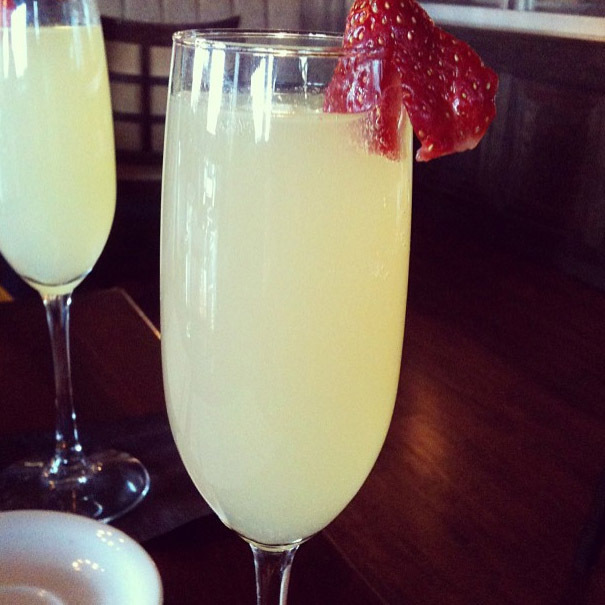 Also, I want another one of those mimosas. ohhh those shoes look gorgeous!!!!! can't wait to see how you style all of the pieces! So jealous of that dress! You look gorgeous in it. Also loving those glasses. I wasn't able to make it out to Target (my wallet will thank me, although my closet resents me for it). Glad you were able to grab some great items!